Features include articles on fashion and accessories, designer profiles and items or places of historic interest. This is mixed with some handy tutorials. 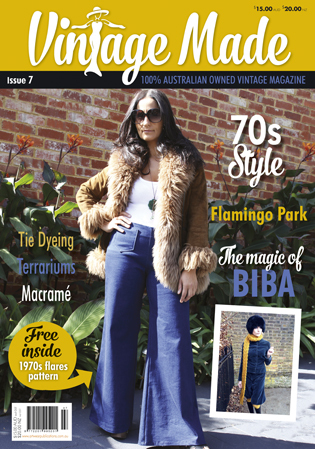 The feature of each issue is the full size garment pattern – this issue is a pair of flared pants. Of special note is the change to our included pattern – we now have sizing from 6 to 26, with beautifully illustrated instructions. In issue 7 we visit the iconic 70s – a time of change and of people questioning everything. Check out the list below to see what we have in store for you! Of special note is the change to our included pattern. We now have sizing from 6 to 26, and beautifully illustrated instructions – the pattern is designed by Ann Grose of Designer Stitch. PEOPLE AND FASHION: Flamingo Park: NGV 200 Years of Fashion by Glennis Murphy; The Gatsby Effect by Kitty Von Tastic; Bibaby Eleanor Keene; Looking Through Rose-Tinted Glasses by Gabriella Holok; Women in Flares by Eleanor Keene. FOOD: Eating in on Home Cooking by Muriel Farquhar; Flavoured Oil: Infused using a Pressure Cooker by Muriel Farquhar.